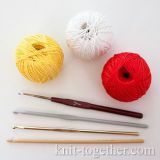 To make it easier to implement a pattern, there are pattern charts with the symbols of knitting techniques. Such a chart shows the pattern by width and height. The pattern borders within the pattern chart are marked by bold lines. In some cases, a pattern starts repeating not from the first row but from the second or third one. It is shown in the pattern chart via a bold line right after the first or second row. One square of the chart means one stitch, with stitch numbers indicated at the bottom of the chart, along the horizontal, from right to left. The numbers of knit rows are indicated to the right of the chart; the numbers of purl rows – to the left. The first row stitches and edge loops are not charted out. The beginning and end of the rapport are marked * on the chart. 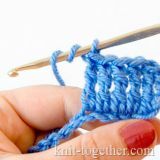 As for how to knit and purl, it is always assumed that it should be done the classical way, unless another description is provided. By default, a yarn over is forward. 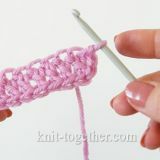 Other ways of knitting stitches and yarn overs are provided separately for the patterns. In some charts, knit and purl rows are shown, in other – only knit ones. Let's review a few features of reading patterns in these cases. Knit according to the chart starting at the bottom up from right to left. 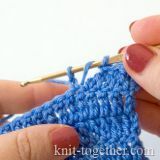 After the last stitch of the rapport first row, keep on knitting the first row pattern, repeating the rapport for several times over the row, depending on the number of the stitches cast. That's why the number of stitches must be a multiple of the number of the rapport stitches, allowing for the pattern symmetry. When the first row is finished, turn the work and knit the second row in reverse, reading the even (wrong-side) row from left to right. All odd (knit) rows are knitted exactly as it is shown by the symbols. In the even (purl) rows, knits and purls are depicted the way they should be done on the front of the work. 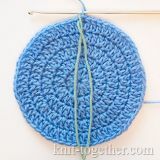 Consequently, at the wrong side, knits and purls must be knitted in the reverse of the shown image. So, in the even rows, where there is a symbol of a knit one should make it a purl and where there is a symbol of a purl – a knit. * All other symbols in the even and odd rows are performed as they are depicted. This is done to present clearly the location of stitches in the pattern. 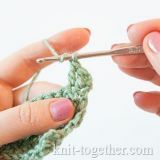 When you finish knitting the last row of the chart, begin to knit the first row again, repeating the rapport in height as many times as necessary. 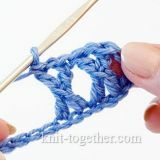 Some patterns show only knit (odd) rows; in this case, the stitches of purl rows should be knitted as they are on the needle: a knit should be made a knit; a purl should be made a purl; yarn overs are knitted as purls, as a rule. 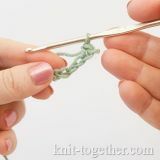 *Note: such a principle for depicting knits and purls is accepted on our website; it is also followed by a few other authors. At the same time, you may come across some charts where these stitches are marked "as is".